Update October 2008! Been wondering when your next issue of RF Design issue will be delivered? The answer we can now confirm is never again! Then something big happened 65 million years ago, and all of the "classic" dinosaurs are gone. Some of the smaller dinosaurs that grew feathers changed themselves into birds, and they are still here, crapping on your car windows. The seminal event that killed off the dinos was probably a meteorite that kicked up enough dirt to drive the planet into a long winter. Fast forward to the twentieth century. Trade journals are all over the planet... The trade journal model is to reveal some knowledge to the reader each month in exchange for bombarding them with advertisements, because no one is going to pay money for something that you can get for free. On the plus side is that the format is handy for long bathroom trips. You have trade journals for marketeers, for human resources, for manufacturing, even for CFOs (perhaps information on how not to get caught). There's a trade journal for people who plan trade shows! Here's one just for pig farmers and another for people that are in the business of landfilling trash (such as thrown away trade journals). Did you know that if you subscribe to enough trade journals, you could heat your house by burning them? If you're interested in the subject, tradepub.com/ lists many of the trade journals out there. Warning: don't subscribe to any trade rags through that site, unless you want over 200 other trade journals to get your personal information! For trade journals, the "meteor event" happened in the 1990s: the internet became the most powerful knowledge tool on the planet. Suddenly, being in the paper trade journal business just got a lot less profitable. So paper trade journals grew "feathers" and have morphed into web sites as well. The problem is, they still want to maximize advertising profits so they can keep as many people on the payroll as possible, and that means they are taking it out on you, the readers. They need to collect personal information such as your phone number, fax number and email addresses, and they milk these for all that they're worth by renting their lists to each other. You get hosed with spam and even worse, free subscription phone calls. During the stock bubble of the 1990's there were new "web portals" and "zines" that promised to change the way that the industry does business. In reality, all they accomplished was burning up a cash pile of investor money, while making knowledge accessibility even more annoying. Some trade journal web sites still don't even know what time it is. They think that you enjoy registering to get tidbits of information, signing in each time you use the site, and having to remember a password. Is using a crummy search tool really the best way to manage the information that was lost in previous "issues"? At Microwaves101.com we have a different goal for the Internet. We want to put all of the collective knowledge of the microwave industry, for your use, just three clicks away. We are doing this by creating a free encyclopedia that is fully indexed and cross-referenced. We don't go out of our way to collect personal information, and whatever we know, we wouldn't share. Read our mission statement for more information. Again, to quote the Disney company, sometimes the smallest thing can make the biggest changes of all." Over time, many of the microwave trade journals are starting to look more and more like Microwaves101. Most of them have dropped the requirement for users to register in order to access the material. Ever wonder where they got that idea? We also recommend that you don't give them a real phone number or email address on the subscription form, unless you like annoying phone calls from call centers in India from people that want to approve you for a free subscription to junk mags like "Connector Specifier". Here's the Golden Rule of trade journal subscriptions: never, ever give them the names of any coworkers no matter how they try to pry this info from you. You wouldn't want your buddies to do that to you, would you? For a great account of how to get rid of pesky telephone salespeople, check out this web site! OK, you have to click the flag to translate it to English... just keep repeating, 'we do not use... (insert product name)". We recently moved this trade journal to the top of our list, because of an experience where editor Nancy Friedrich exceeded our expectations! Looks a lot like this graph from Microwaves101's VSWR page, doesn't it? Update February 19, 2008: National Instruments contacted this web site and stated that the two look-alike graphs are a mere coincidence. All a big misunderstanding! OK, here's the Perry Mason moment. Our graph had two major mistakes in it, and so did the National Instruments graph. The transmitted wave voltage amplitude is wrong for a couple of reasons which we'll explain shortly, it should NOT be 0.7 volts like it is in both graphs. Is it all a coincidence that a NI author used the same wavenumber, the same incident voltage amplitude, didn't use vertical grid lines, used the same reflection coefficient (pick a random number between 0 and 1 and both authors came up with exactly 0.3) and made the same stupid mistakes? What are the chances of that? Below is a corrected graph. You'll probably see a similar correction to the MW&RF article in the near future, we reckon. Anyhoo, when we pointed out the similarities (and lack of attribution to Microwaves101) to Nancy she was very apologetic, even though there's no way she could have known that one of her contributors might have used our material. She published our "complaint" two months later, and added an attribution to the article on the Microwaves and RF web site. Kudos to Nancy, you're so nice it makes us feel rotten for even pointing out this little problem! The National Instruments rebuttal will appear in an upcoming MW&RF issue, but we don't plan to respond to their response of our response to their article. Nuff said! Update March 2008! We reworked the spreadsheet that created this graph into something we're proud of, the math is now correct, and we added a slider bar so you can animate time. Check it out on our new page on visualizing VSWR. We're more than happy to help out with free tools like this, we offer the spreadsheet that created this graph as a free download. Just give us a little credit when you take a shortcut. Now back to our description of MW&RF... this is one of two trade journals (Microwave Journal is the other) that has survived since the beginnings of Microwave History (in their 46th? year). As a microwave engineer, you need to subscribe to the paper version of both of these, and at least flip through them once a month during lunch. MW&RF does NOT require you to register personal information in order to peruse the material on their web site, the way all trade web journal web sites should be. Technical Director Jack Browne knows as much about the black art of microwave engineering as anyone on the planet, plus he's a great writer. MW&RF is published by Penton which owns many other trade rags. Which is a problem for you because once they capture your phone number and email address, someone from India will be calling to offer you a free subscription to other "Planet EE" crapola once a month, plus your email will get spammed almost every day. See "countermeasures" above. MW&RF has a "Microwave Legends" page that looks a lot like our Microwaves Hall of Fame, but in this case, imitation is flattery! Microwave Journal is sort of the grandfather of industry trade rags, having been around for some 60 years. If you're a regular reader of Microwaves101, you may remember that a while back we were complaining about MJ's policy of requiring registration to read their articles. Well, we're happy say that this seems to have changed, and there's actually a bunch of good content over there now that you can read without dropping any personal information. We're also fans of editor Pat Hindle's beach videos in the "Frequency Matters" series - check them out! This magazine puts forth a good effort. Editorial director Gary Breed is a one-man encyclopedia of microwave knowledge, we'd like to offer him a job at Microwaves101, but we understand he's gotta be able to feed his family. HFE recently finished an awesome feature on power amplifier technology, co-authored by a whole congress of microwave gurus, and you can download it on their web site last we checked. Gary printed some kind words about Microwaves101 in a recent HFE web site review, for which we say "thanks! ", even though Microwaves101.com was spelled wrong. HFE puts their paper journal on line in a pdf file that is an exact replica, ads and all. No account setup or password is required to access articles last time we checked. Update October 2008. Because of the recent (2006) merger of Penton and Prism publishing houses, a group of investors found themselves with two microwave/RF trade journals. RF Design and Microwaves and RF became step brothers. Hey, I never asked you, do you like guacamole? After the usual round of merger-induced layoffs, one of the titles had to go. Congratulations on keeping the better of the two. In case you were wondering, the printed supplement to RF Design, Military Electronics also bit the dust, so you will no longer have to tear open a plastic bag each month in order to place ME in a suitable recycle bin. But wait! Defense Electronics (the print version) may be dead but it will be re-launched as a digital publication in January 2009. Essentially, Penton is taking the current Military Electronics digital publication and revamping it with a new (or old depending on your point of view) title Defense Electronics). Jack Browne will be the technical director. If you're confused by the history behind Defense Electronics and Military Electronics, you are probably not alone. Send us a note if you can clue us all in! How about straightening us out, Jack? This journal started December 2002, and was dead and buried sometime in 2004. It was a cousin to Electronic Design, perhaps the most annoying trade rag of all time. How many call centers in Hyderabad India are solely employed by ED to pester engineers about subscribing to this dull magazine? We don't know, however, the acronym "ED" has such a negative connotation that we'd probably change the name if we were in charge. This journal is 99% ads, with a "product features" sometimes disguised as technical articles, plus an editorial page. Keep in mind you can learn a lot about the industry by reading advertisements, especially if your job involves buying stuff rather than designing stuff. These fools keep changing the URL for their web site, so we apologize in advance if their link is broken. If you are involved in MMICs or RFICs, consider expanding your knowledge of the subject by subscribing to a semiconductor magazine. 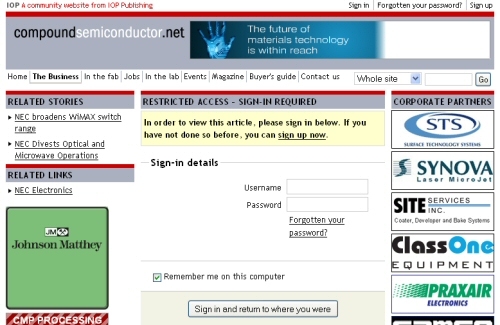 Semiconductor Today is a British effort, at this point they are the best semiconductor trade magazine of all, with no competition now that Compound Semi is asking for users to register. We've met editors Mark Telford and Darren Cummings, they are both great guys and they totally "get it" about providing easy access to their articles on line. The web site is well organized and the use of big fonts makes it easy to read. They offer a paper subscription as well. These people don't get it. This used to be a good site, but recently they have required users to register. That's a dealbreaker for us, and it should be for you too. Once they see how much readership drops they'll drop this requirement! III-Vs Review ceased publication in 2006. Electronics Cooling is an independent trade journal (as opposed to most of the above being part of Horizon House or Penton Publications). If your career is in electronics, at some point you'll have to learn about cooling, so why not subscribe to this free journal? Tell "Doctor Jim" that the Unknown Editor sent you his way!